We are surrounded by headlines like “America is facing a ‘retail refugee crisis’ as thousands of stores shut down and millions of people become the ‘blacksmiths of their era’” (Business Insider, September 2017). We knew that digital would transform retail as we knew it. But the speed is startling! Back in 2011, MESH Experience spotted a trend. Within two years the percentage of people reporting an experience in store for our client had halved! Further digging revealed that people were, indeed, going online, mainly to retailer websites. Moreover, we saw this early in the path to purchase, when they were researching what brand to buy, and towards the end of the journey, when they were searching where to buy their chosen brand at the best price. This insight changed the way our client worked with their retail partners. We had no idea how radically the retail landscape would be changing in the next 5 years. Sampling. Consumption touchpoints are normally the most engaging and persuasive experiences that people have with brands. So getting to try the product in a retail environment is very powerful. Speaking to assistants. A great staff interaction transforms a retail experience. Touching and feeling the product. Reading about the car online isn’t the same as sitting inside the car, smelling the leather and holding the steering wheel. These give us clues to how bricks and mortar retail can be re-purposed. It needs to transform from transactional to experiential. The implication of this shift is profound. The purpose of bricks and mortar retail is no longer to generate sales but to build brands. It needs to be on the media plan alongside TV and other brand building channels. We are now seeing brands creating amazing brand touchpoints in retail. Take Hermes Dip-Dye Laundromat in pop-ups across Europe and the US. Customers are invited to bring their Hermes scarves, dye them and fall in love with them all over again. And what about the Magnum Pleasure store, another pop-up which sees lines around the block as customers await personalized confections that gleam like jewels? What these brands understand is that the experience people have in these stores will have a long-term effect. Seeing and tasting the quality of a gorgeous Magnum ice cream has a greater chance of changing brand perception than being told about it in a TV or press ad. What’s more, not only is the depth and quality of experience greater but, with social media, the spread of messaging to friends and relatives, means that those who haven’t ever been will hear about it. If retail is transforming we need new frameworks and tools to measure its impact. We believe that in today’s world marketers should take an Experience Driven Marketing approach. We have an Experience Model to help clients grow brands. We have discovered that Share of Experience (SOE) (all paid, owned and earned media) has a greater correlation with market share than Share of Voice so think “SOE” when it comes to deciding investment levels. A Positive Experience has three times the impact of a neutral one on brand consideration. So if you want to grow your brand, ensure you are generating more positive experiences. You can give your brand an unfair advantage through message, placement and context. Compare the quantity and quality of retail experiences in the context of all other paid, owned and earned media. Don’t stop at sales, measure emotional response to retail display. New tools can help us. MESH Experience specializes in capturing every experience people have with brands. To maximize the impact of retail, it is important to place retail in the context of all your other touchpoints to see whether to invest more here and less elsewhere. More recently we have started using new tech-enabled tools within retail displays. 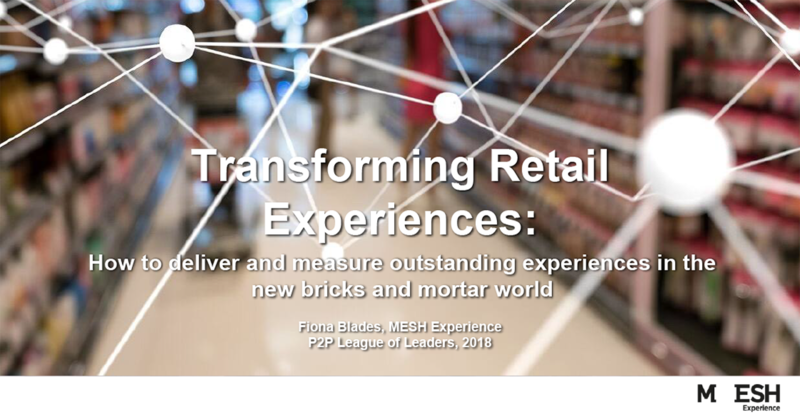 MESH Experience has developed a way to evaluate retail display using cameras and algorithms, without video and the need to store personal information. Sharing a Unilever case study, we will demonstrate how this real-world data stream identifies whether display has stopping power, gains attention and elicits smiles. In conclusion, we need to think beyond transactional to experiential. Make bricks and mortar retail a key brand building touchpoint – and put it on the media plan. Apply Experience Driven Marketing principles to see how retail can create positive experiences with spread/reach. And when it comes to measurement, ensure that you measure your retail touchpoints in the context of all other paid, owned and earned. Don’t just measure sales, but understand the emotional impact your work is having. Retail is transforming. So are our insight tools. Discover this new technology-driven, real-time approach to evaluating the return on retail investment. Download the Transforming Retail Experiences presentation for FREE to learn more.